When Jeff Williams co-founded Macphersons Resources with formidable Western Australian businessman Ashok Parekh and experienced private entrepreneur Ray Wright the trio had their sights firmly set on an area called Coolgardie, just West of Kalgoorlie the home of KCGM’s Super Pit gold mine. In the seven years since listing the regional focus has not changed but the company has accumulated a number of assets in Boorara, to the East of Kalgoorlie, and is now set on drilling out the Boorara gold project to identify how big the resource is and prove up a project to go to the capital markets. Williams has been around the block once or twice when it comes to bringing gold projects to production. The Macphersons managing director has spent the best part of a 40-year career in the industry developing gold projects around the world. When Williams joined Macphersons in May 2016 he was tasked with the sizeable challenge of delivering the flagship project’s bankable feasibility study (BFS) and subsequently realising commercial production at the Nimbus-Boorara mine leases. The company has made major progress under his stewardship. Parekh has also been instrumental in promoting the company, he has excellent people skills, providing any assistance to source new projects and ideas and has supported the entire management team. So the Kalgoorlie management under GM Andrew Pumphrey could get a real grasp of the geology of the Boorara gold deposit, Pumphrey initiated an open pit trial in October 2016. The intention was not to make quick cash but to understand the geology, identify the grade of the resource and discover how complex the metallurgy is. Macphersons did a deal with a local mill to process the material and the trial also threw up some unexpected results. “Before we started we thought there was about 1.2-1.3g/t gold (Au) in the open pit. We drilled it out on a 4mx4m tight grid using reverse circulation vertical holes and an independent geologist said there was actually 2.03g/t Au,” Williams says. “That opened a couple of red flags though ‘very nice but what on earth is going on?’. We mined in quick time with contract labour from Kalgoorlie and at 2.03g/t under Pumphries direction and we made $300,000 which was great but we weren’t in it to make money. However, the real turning point on the project came when Pumphrey suggested the company bring in a structural geologist to reassess the drilling strategy. Gerard Tripp was brought onboard as a consultant and suggested the company should re-orientate the drilling direction. Tripp said the company had been drilling the resource the wrong way and so had a number of the major miners before them. Macphersons then began the process of drilling across the three zones; the Northern stock works, the central Crown Jewel and the Southern stock works. Pumphrey identified the Northern zone as more complex than the Southern zone so drilling began there, “At the Northern end, we put two drills on the strike of the orezone, which was striking at 330 degrees north-west. “We were trying to strike the dolerite host which hosts the mineralisation and for some reason we got bits of it but not much. We went to the Southern zone and the geologist [Tripp] said to orientate the drill azimuth at 115 degrees. Following the change in tack on the drilling strategy Macphersons has continued to release strong results on the project. Williams says the company is hitting good grades with other highlights of 158m @ 1.6 g/t Au and 57m @ 3 g/t Au. The project’s location in Kalgoorlie is a key strength when Williams casts his mind forward to the potential of commercial production operating on site. The region has a long history of gold mining and is considered a premier mining district on global terms. There is ample local skilled labour, as well as simple access to equipment suppliers and drills. Then there are four operating mills within 40km. “The Kalgoorlie area is a premier gold field globally in terms of having skills, equipment and everything else in one place. Boorara is on a mine lease and we have power to the site, we have sufficient water to process a million tonnes and we’ve got all the permitting so we are in a good place,” says Williams. 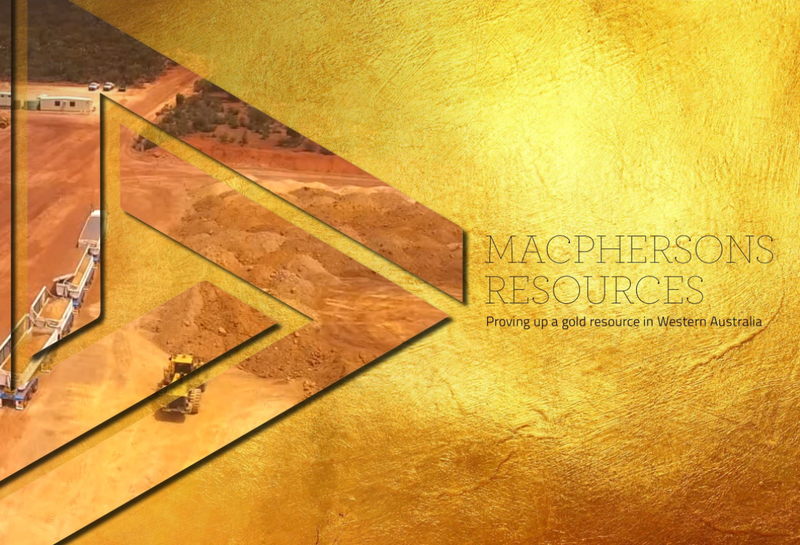 Macphersons has a small but dedicated team based in Kalgoorlie who will drive the project towards a fully identified mineral resource hopefully by the end of 2017. Williams outlines that it is the mineral resource which supplants value in the company, so far it has announced 232,000 ounces as per JORC 2012. The company is busy undertaking a drilling campaign at the project in order to get a true understanding of the size of the deposit. Having found mineralisation along strike of 500m and at least 250m deep, Macphersons is going back in to find try to extend the Crown Jewel area and expand the resource at depth along the Northwest trend. “That’s what we are doing right now because you have to get the company to expand the resource and be in a position to have aspirations to go into production,” Williams explains. As Macphersons brings the resource through there is a hope that it could replicate the success of KCGM’s Mt Charlotte mega-mine. The historic mine has very similar mineralisation to Boorara and an almost identical dolerite system, according to Williams. “We are hopeful that Boorara becomes a major resource and extends at depth and along strike. We are hopeful we can get over a million ounces as a minimum resource,” Williams says. With his sights set on a million-ounce resource at Boorara it is no wonder Williams is keen to get the drilling completed in time to release a full mineral resource by the end of 2017.